Why We Love returns this week with a loving look at resurgent Frenchman, Gael Monfils. Sports is an entertainment industry. Yes, it’s about particularly talented and dedicated individuals achieving great strides in human physical potential. Yes, it’s about fighting for a particularly venerated spot in world history. But it’s also about making money and putting on a show. Every player (and certainly every tournament director) knows this – eyes on screens and bodies in seats are what keep sport alive. In tennis, two to four individuals step onto a court and, if they do their jobs really well, can make moving a ball back and forth over a net worth hours of viewer’s time. Tennis fans who dedicate most of their free time to following the sport know that not every match will be a blockbuster, but they also learn quickly how to hedge their bets when it comes to entertainment potential. Certain match-ups leave mouths watering (Novak Djokovic vs. Rafael Nadal, anyone?) while others leave people cold (Novak Djokovic vs. Andy Murray, anyone? ), but there are also individuals who can be relied upon to provide a great show with almost anyone across the net. Gael Monfils is one such individual. The Frenchman, whose highest ranking stands at No. 7, is undoubtedly one of the most talented men on the ATP World Tour. His winning combination of incredible court coverage and almost kamikaze-like offense have taken him to a French Open semifinal and two US Open quarterfinals. Outside the game’s biggest stages, he has never been able to win a tournament of higher esteem than his five ATP 250s. Most in the tennis world believe that Monfils could (and should) have achieved much more at this point in his career were his focus more on consistency than the distracting dedication towards putting on a show. 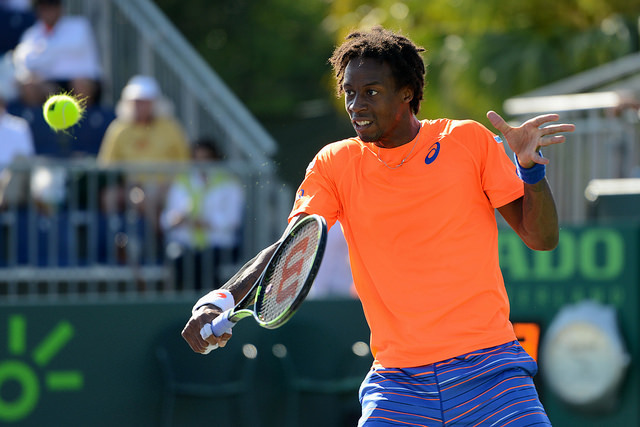 Because putting on a show is what Gael Monfils does best. Despite his relatively low profile deep in the biggest tournaments, Monfils is one of the most recognized figures of the men’s sport, thanks to his constant willingness to engage with crowds around the world. Few players on tour motion to the crowd so regularly, insist on their applause and ensure they remain on the edge of their seats. This week in Monte Carlo, we saw, once again, just how great a tennis player Gael Monfils can be. In two tough sets, the Frenchman got the better of Roger Federer for the fourth time in his career, and went on to dominate Bulgaria’s Grigor Dimitrov in the next round, before falling in the semifinal to the ever-competitive Tomas Berdych. The problem, most would argue, is that Monfils can rarely back up his big wins with meaningful runs. The big stage excites him, but ask him to maintain that enthusiasm and concentration and you quickly run into problems. Of course, crowd engagement is not just for the benefit of the crowd. It is clear that Monfils is at his best when he faces the best opponents on the biggest stages – with the loudest crowds. Atmosphere is everything for the Frenchman, which best explains the flat performances for which he is infamous after a big win – when he’s just a tennis player again, when he just has to pick up his racquet and face an opponent of equal standing, and when he’s no longer the beloved underdog putting on a transcendent performance. That’s a tough task in any line of work. The regularity with which Monfils’ record is met with eye-rolling increases each year, but I’m not sure it’s fair to criticize the Frenchman too heavily for his efforts thus far. I prefer we celebrate the sport’s biggest performers, those who make highlight reels or who populate YouTube with engaging shot-making that can only encourage more people to engage with the game. In tennis, players are generally only as good as the last round they reached. It’s not enough to defeat Roger Federer in a third round if your name isn’t in the draw come finals day. By Monte Carlo next year, everyone will remember who the defending champion is, and few will deign to recall Monfils’ one great performance. My question is this: are we okay that? Are we content to take our under-achieving showmen and lock their successes away with a dismissive shrug? I’m not, and I refuse to categorize Gael Monfils as an “underachiever.” Instead, we should praise Monfils for reliably putting butts in seats around the world with thrilling, daring, showman’s tennis. We should laud Monfils for those moments when his game elevates above the everyday, and threatens the very best the sport has ever had to offer. We should recognize that when players see Monfils in their bracket, they know to expect the unexpected, an excited crowd, and a physically and emotionally draining encounter. Will he win every match playing as he does? No. Winning ugly great, but losing beautifully has its benefits, as well. Monfils has not won the tournaments he could have won yet. But he is still here, working as hard as he can, playing tennis that advertises the brilliance of this sport to the world. Should he never reach the highest heights of the sport, let history reflect that Monfils stepped out onto court and boy, did he put on show. What do you think of Gael Monfils’ place in the sport? Sound off in the comments!